HÀ NỘI – Việt Nam and China yesterday issued a joint statement stating their determination to fully exploit and build on existing synergies. Accordingly, the two countries will strengthen their comprehensive strategic co-operative partnership to meet the practical interests of both peoples and for the cause of peace, stability and prosperity in the region. The statement was issued at the conclusion of a two-day (Nov 12-13) State visit to Việt Nam made by Xi Jinping, General Secretary of the Communist Party of China (CPC) Central Committee and State President. Earlier, Xi also attended the 25th APEC Economic Leaders’ Meeting in Đà Nẵng. The two countries pledged to work together, thoroughly grasp major orientations guiding development of bilateral ties, intensify strategic exchanges and political trust, deepen win-win co-operation, and deal with disagreements in a mutually satisfactory manner. They also agreed to ensure stable and healthy growth of their comprehensive strategic cooperative partnership towards concrete benefits for their peoples. They agreed that Việt Nam and China are important neighbours and co-operative partners. As both are in a key phase of development reforms, the growth of one country is opportunity for the other, the statement said. Therefore, the two countries need to promote the co-ordinating role of co-operative mechanisms, like the meeting of representatives of the two Political Bureaus and the Steering Committee on Bilateral Cooperation. They will give priority to more sharing of experiences in State management, strengthening exchanges via Party channels, and boosting co-operation between the Vietnamese National Assembly and the National People’s Congress of China, and between the Vietnam Fatherland Front and the National Committee of the Chinese People’s Political Consultative Conference, the statement said. They two countries also committed themselves to efficient implementation of an agreement on stepping up collaboration between the two Foreign Ministries. Both sides agreed to strengthen co-operation in defence, security and law enforcement, implementing well the declaration on joint vision on defence co-operation by 2025, use the hotline between the two Defence Ministries effectively, organise order defence exchanges and strategic defence dialogues as well as joint patrols in the Gulf of Tonkin. They would also work to make the Viet Nam-China extradition treaty become effective soon. Efficient measures will be taken to boost co-operation for practical progress in economy, trade, production capacity, investment, infrastructure and finance. 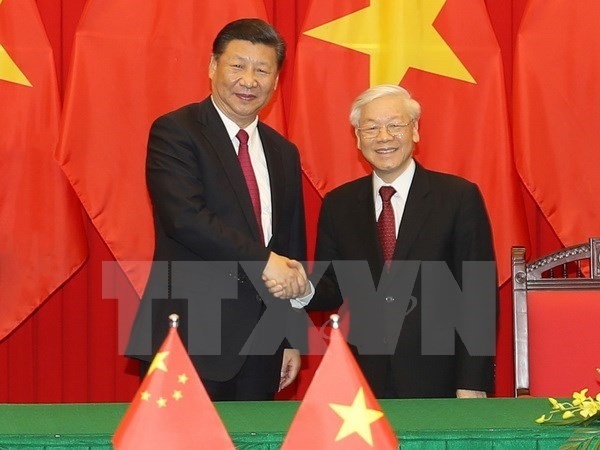 The statement said Việt Nam welcomes and supports implementation of the “One Belt, One Road” initiative to boost win-win cooperation and economic linkages between countries as well as regional connectivity. The two countries will share information on investment policies and work to improve the investment climate, they said. China said it would encourage its leading enterprises to invest in Việt Nam. It was agreed that a five-year (2017-2021) development plan on economic and trade co-operation will be implemented and key co-operative projects signed and deployed. The role of Việt Nam-China Committee on Economic and Trade Co-operation and related cooperative mechanisms will be promoted. China expressed its readiness to expand imports from Việt Nam, giving priority to assessing market entry requirements for milk and milk products from Việt Nam, speed up completion of relevant legal procedures and open up its market for several varieties of Vietnamese fruits. They would also intensify co-operation in agriculture, fisheries and forestry, including rice and cassava cultivation. The two sides said they would use the working group mechanism to boost financial-monetary cooperation, consider the use of local currency in bilateral trade and investment and step up exchanges on monetary policy and financial stability. China agreed to create favourable conditions for Viet Nam to gain access to its preferential loans and other forms of credit in compliance with related regulations. Việt Nam and China also agreed to promote co-operation in agriculture, water resources, the environment, science and technology and transport; and broaden their partnership in culture, media, healthcare, and people-to-people exchanges. They agreed to promote a sincere and frank exchange of views on issues at sea and continue observing important, common understandings reached by leaders of the two Parties and States, including the “Việt Nam-China agreement on basic principles guiding the settlement of sea-related issues”. The government-level negotiation mechanism will be efficiently deployed for dealing with territorial and border issues and both sides will seek a mutually acceptable fundamental and long-term solution. The two sides agreed to implement well the follow-up work after concluding their joint survey of waters off the mouth of the Gulf of Tonkin, accelerate negotiations on delineation these waters and foster mutual development. They will also continue to promote efforts of the working group on development co-operation at sea and step up joint projects in less-sensitive fields as previously agreed. Both sides highly appreciated activities involving the release of aquatic creatures and the protection of marine resources in the Gulf of Tonkin. They agreed to fully and effectively implement the Declaration on the Conduct of Parties in the East Sea (DOC) and work towards the early formation of a Code of Conduct of Parties in the East Sea (COC) on the basis of consensus consultation, effectively managing maritime disputes and avoiding actions that would further complicate or expand the disputes so as to maintain peace and stability in the East Sea. Việt Nam affirmed that it would consistently pursue the one-China policy and support the peaceful development of Cross-Strait relations as well as China’s great cause of unification. Both sides agreed to boost co-operation at regional and multilateral frameworks such as the United Nations, Asia-Pacific Economic Cooperation (APEC), Asia-Europe Meeting (ASEM), ASEAN-China, and Mekong – Lancang Cooperation.